The most frequent request I get from clients is for help organizing paperwork. A lot of people live with piles of papers stacked throughout the house, unsure what to do with the various types of printed information that enters their home on a daily basis. This can include catalogs, fliers, schedules, coupons, bills, medical or financial statements, legal paperwork, tax information, invitations, and much more. It can all be pretty overwhelming., The longer things remain unresolved, the higher the stacks grow, and the more overwhelming things become. If you're someone who feels like you are continually yielding ground to ever encroaching piles of paper, do not despair. I'm here to offer hope in the form of simple guidelines for decluttering papers. To better serve my clients I have created a list of what to keep and for how long. No more worrying about whether or not you'll need a particular paper someday. Now you can make informed decisions and part with unnecessary papers with confidence. Often among the piles of paper I encounter I find oodles of what most of us would call junk mail: catalogs, coupons, promotional post cards, newspaper inserts, advertisements, political propaganda, and so forth. This is the first and simplest category of papers to deal with because it's all pretty much trash, and it's easy to determine a (semi)permanent home for whatever isn't. The best place for junk mail is the recycling bin. If you live in a community that doesn't offer recycling, then the trash is the next best place. 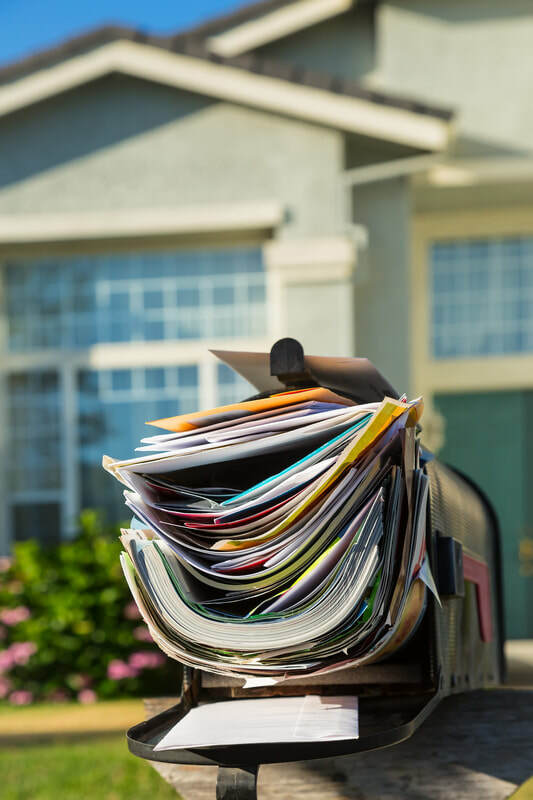 You may be surprised how much of your paper clutter you can eliminate just by establishing a habit of disposing of junk mail as soon as it enters your home. For items you want to hold onto temporarily, such as coupons, create a file or folder to keep track of these items. Consider placing this folder in your car so that you're sure to have the coupon with you when you need it. Business cards are an excellent way to exchange contact information, but they can quickly pile up for those who are in the habit of collecting them. This is because it takes time to input a person's information into your phone - that is to say, it did. If you find yourself amassing business cards, consider downloading one of the many business card scanner apps available. The Balance Small Business offers their picks for The 8 Best Business Card Scanner Apps to Use in 2019. Most people deal with the following types of paperwork at some point or other, usually on a pretty consistent basis. These days much of the information indicated below can be filed or otherwise maintained electronically, making it unnecessary in some cases to retain a paper copy of the information. If there is a chance you might need to return an item, keep the receipt until the return period has passed (or the item has been returned). Keep receipts for big ticket items such as major appliances, electronics, or jewelry for the purpose of establishing value in the case of theft or damage. Keep receipts for items with a warranty. In the event you need to utilize the warranty, the company will likely want to know when and where the item was purchased and possibly how much you paid for it. Your receipt also serves as your proof of purchase. Staple the receipt to the warranty information. Keep receipts that are needed for tax purposes such as business receipts, receipts for home improvement, donation receipts, etc.. Discard receipts that don’t meet the above criteria. Shred any receipts that include credit/debit card information. Keep a copy of insurance policy information until you renew or cancel the policy. If your policy information is available online (and it is), you might choose not to keep a paper copy on hand. That said, I recommend at least maintaining a list of insurance providers that includes type of coverage and policy numbers. This should be kept in a place where family members can easily find it in case of emergency. Reconcile statements with your own records monthly (if not weekly) and discard. This information is available online, so consider having statements sent to you electronically to reduce paper clutter. If your statements contain information needed for tax filing purposes, file them with the tax information for the relevant year. If you maintain a balance on your credit card, keep the most current statement on file and shred previous statements. Keep for a year so that you can use them to verify the accuracy of your W-2 form when filing your income taxes. Depending on your filing circumstances, the IRS may request supporting documentation for three to seven years after you file a return. Knowing that, a good rule of thumb is to save any document that verifies information on your tax return — including Forms W–2 and 1099, bank and brokerage statements, tuition payments, charitable donation receipts, etc. — for seven years. File these items together according to year. Each year when you complete your taxes, add the most recent year to your files and shred anything older than seven years. There are two schools of thought with regard to how long you should hold onto bill payment stubs. Some people will tell you to save these for a year from payment. In which case, I would recommend shredding the oldest payment stub each time you add a newly paid stub to your file so that there are never more than a year's worth of payment stubs in your file. Others recommend keeping bill payment stubs only until the payment is confirmed. I recommend setting up paperless billing. You can have payments withdrawn automatically or pay them manually each month. Either way, you will receive e-mail notifications and statements regarding your payment which you can file on your computer where they won't take up physical space. Often people with chronic health conditions have problems with paper clutter. Between the medical bills, the insurance information, medical test results and records, it's easy to get overwhelmed with papers, especially if you're dealing with the VA, Workers' Compensation, or disability paperwork as well. For this reason, I like to separate medical information into two types: Individual medical information and health benefit information. This includes x-rays, test results, medical reports, and other information that could be used to document an individual's personal health history. In general, this information should be kept so that, when necessary, it can be shared with health care providers. It is also valuable for establishing family medical histories. I like to create a file for each specific medical condition with the most recent information at the front of the file. Keep in mind that not all test results should be kept indefinitely. Only keep the most recent results for things like cholesterol and vitamin levels, and other changing dynamics. If you need to see change over time, consider making a chart on which to record results and toss the individual lab printouts. Keep things that aren't likely to change, such as allergy test results, for reference. While it's good to hang onto this information, it isn't necessary to keep all of it in your filing cabinet. Files relating to previous medical conditions can be archived in an attic, basement, or other storage space. Just be sure they are clearly labeled for ease in finding them should you need to reference them. This refers to information regarding health care coverage, medical bills, payments, etc. Keep EOBs up to one year or until payment is fully reconciled for a given service. As you well know, each time you visit a new health care provider, you're required to fill out a plethora of paperwork which often includes a detailed account of your personal and family medical histories. 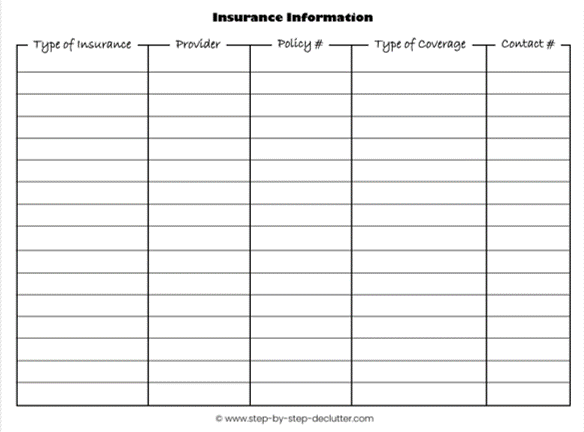 To make this easier, I created this handy Individual Medical Information form to help you track this information in one place. Gain access to this and other helpful forms available in my free printables library by clicking on the image below. Also available in the free printables library are my Prescription Drug Information sheet and my Immunization Schedule. Keep the most current statement on file. Discard old statements. Keep so long as you own the property. Pass on to new owner when selling. Keep until you sell the item the loan was for. When paid in full, keep a record of payoff. Keep a record so long as you own the property. Pass this information on to new owner when selling. Maintain a current copy so long as the contract is in force. If contract is amended, keep most current copy. Keep until you sell or discard the item or the warranty becomes invalid/expires. Keep until you cash or sell the item. Keep so long as it’s valid. Passports are good for 10 years – keep most current passport even if expired as they will want you to mail it in when you apply for a replacement. I hope these guidelines give you the confidence you need to part with unnecessary papers.